Fresh from her adventures in DETECTIVE COMICS, Katherine Kane returns with her own DC Rebirth title - and an intriguing new mystery to solve - in BATWOMAN VOL. 1: THE MANY ARMS OF DEATH. Someone is selling cutting-edge weaponry on the black market, and their aim is to kill as many people - from as many nations - as possible. 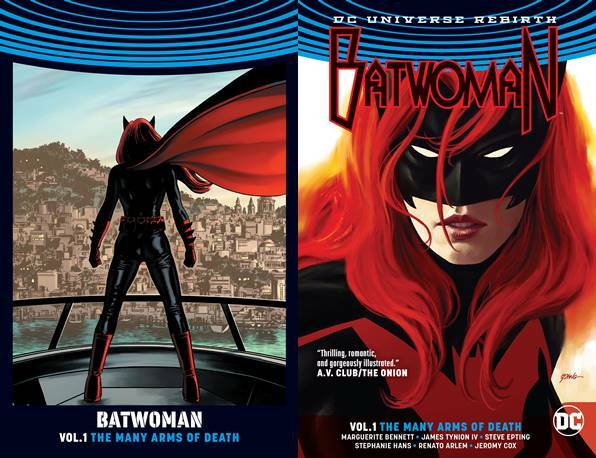 With help from her intrepid assistant, Julia Pennyworth, and their high-tech mobile command center, the yacht Sequoia, Batwoman quickly tracks the weapons to their source: a small, lawless island known as Coryana, home to pirates, outlaws... and a year of Batwoman's life. Back before she joined the Bat-Family, Kate Kane spent some time with Coryana's unofficial matriarch - and nearly lost herself in the process. Now her past is quickly catching up to her, and if Batwoman can't figure out who to trust, the next thing she loses will be her life! Acclaimed writers Marguerite Bennett and James Tynion IV and artists Steve Epting (Captain America: The Winter Soldier), Stephanie Hans and Renato Arlem launch Batwoman into an explosive new era in BATWOMAN VOL. 1: THE MANY ARMS OF DEATH, collecting the BATWOMAN: REBIRTH one-shot special and issues #1-6.